Part of the upcoming online auction of South Asian Art are miniature paintings from the Indian subcontinent, showcasing different schools of classical paintings from 17th to 19th century. This one in particular uses opaque pigments and gold on paper, a medium unique in classical Indian miniature painting. Maharao Ram Singh of Kota (r. 1827-66) is one of the best represented of Rajput rulers with many aspects of his life both public and personal documented by his artists. He is represented in durbars with his court and with British officials, in the many festivals of the Hindu calendar, including Dussehra as here, the Asapura festival (Kreisel 1995, fig. 132), and the riotous spring festival of Holi (Topsfield 1980, pl. 7), as well as personal worship of the deities (Seyller 2015, no. 60) , and of course many scenes of personal interest such as riding an elephant on top of the chajja of a pavilion in 1853 (Ehnbom1985, no. 64), playing polo with his noblemen (Welch 1997, no 63), entering Delhi in 1842 (ibid., no. 65), and scenes of him enjoying himself with his women (Seyller 2015, no. 61). Here, he is celebrating the autumnal Dussehra festival, commemorating the slaying of the buffalo-headed demon Mahishasura by the Devi, by hunting and killing a buffalo in a ritual slaying. Other pictures suggest that this was not a solitary affair but was a communal ceremony undertaken with his nobles (Kreisel ed. 1995, fig. 133). 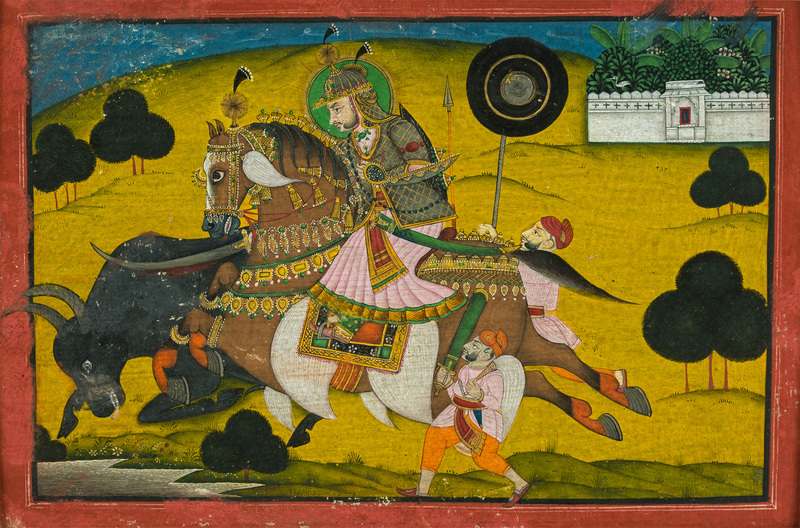 In our splendidly energetic painting, the Maharao is gorgeously apparelled in helmet and body armour, with room of course for jewels, over a lilac jama. He carries a small shield in his left hand which holds the reins, while an empty scabbard is by his side, the sword being used to slice at the neck of the buffalo, which is falling to the ground behind the horse. The horse is even more gorgeously caparisoned than the Maharao, with its tasselled mane, jewelled bridle and many chains with attached gold plates. Two attendants run beside on foot, one with a khanda sword and a chowrie, and the other with a sun-burst parasol. The latter may also be carrying an upright spear, unless it is attached to the horse in some way or held by an invisible attendant. The scene is set below a plain green hillside dotted with a few trees and with a walled garden near the summit of the hill. The Maharao here appears relatively young, being without his full set of bushy sideburns that grew gradually over the course of his reign. He came to the throne at the age of 19 and one of his earliest datable portraits shows him about 25 (Bautze’s fig. 14 in Welch et al. 1997, p. 53), when his sideburns were already heavier than they are in our painting. His profile with its bulbous ending to the nose and protruding lips is instantly recognisable. The horse rolls its eyes as the buffalo falls dying to the ground, its horns obtruding into the margin, but Ram Singh’s grave face is devoid of the pleasure of the hunt but rather intent on doing his ritual duty. A later and rather stiffer picture dated 1859 in the Mittal Museum in Hyderabad (Seyller ed. 2015, no. 63) shows the same ritual killing of the buffalo but with the Maharao using a spear rather than a sword, while a preliminary drawing for that painting is in the V&A Museum (Archer 1959, Kotah fig. 49).